The DrillNDrive is a woodworking drill and drive system, combining a hexagonal base countersink with a drill bit. This new, made in England, drill and drive tool is unlike the majority of drill and drive systems. The DrillNDrive does not flip over or require an additional quick release chuck, it operates quickly and easily with a push on - pull off driver sleeve that locates over a countersink and drill bit, there’s no need to un-chuck the drill to change bits. The push on the driver sleeve is compatible with all ¼” insert driver bits. In tests it was up to 4 times faster than conventional methods and 10 times quicker at changing from drilling to driving. The DrillNDrive is available from DIY stores, builders merchants and hardware shops, it is also available on line. For a list of stockists click here. 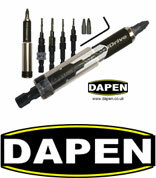 lets-do-diy.com has 5 Dapen DrillNDrive to be won in a free to enter competition. Q. To WIN this great tool, simply tell us where is the Dapin DrillNDrive made? 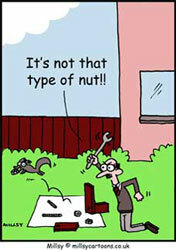 We'd like to keep you updated by email with the latest news and competitions from lets-do-diy.com. If you'd prefer not to receive this information, please tick here. We may make portions of our mailing list available to carefully selected organisations whose products may be of interest to you. If you would prefer not to receive such mailings, please tick this box. All entries must be received by 30/04/2009.